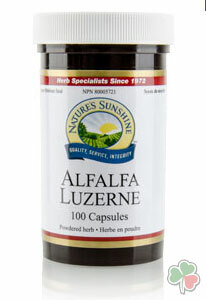 Alfalfa aids in the digestive process because it contains the enzyme betaine. It is an excellent source of vitamins A, C, thiamin and niacin. Contains natural chlorophyllins, the green pigment in plants. Contains additional vitamins and minerals. Suggestion Directions: Use 1 capsule with a full glass of water three times a day with food; once at breakfast, once at lunch and once at dinner to achieve maximum effectiveness. You may increase to 2 capsules at a time if recommended by a holistic health professional. For therapeutic use.